Earthquakes may last only seconds but they can shake up our lives for weeks and months to come. You can minimize your financial hardship by organizing important documents, strengthening your property and considering earthquake insurance (California residents visit EarthquakeAuthority.com). You may need to leave your house quickly after an earthquake, if there’s a fire, etc. To help you organize the most important information you will need, begin with designating a “grab-and-go” backpack or bag. Consider what documents you will need if you are away from home for an extended time (such as what you will need as identification, to reach loved ones, to file an insurance claim, etc.) Put all of these important documents in a sealed plastic bag, then place it into your “grab-and-go” bag. Leave your “grab-and-go” somewhere you can get to easily. Most houses, apartment buildings, or commercial buildings are not as safe as they could be, especially if they are more than 30 years old. While building codes have been improved over time, few building codes require issues with older buildings to be fixed. Still, there are things that you can do to improve the structural integrity of your home or other building. Below are some of the most common issues. Others are listed on the menus at right (residential or commercial). Inadequate foundations. Look under your house at your foundation. If the foundation is damaged or built in the “pier and post” style, consult a contractor or engineer about replacing it with a continuous perimeter foundation. Look for bolts, and square washers, in the mudsills (so you see a connection between the base of the home’s wood frame and the poured concrete foundation). They should be no more than 1.8 meters (6 feet) apart in a single story and 1.2 meters (4 feet) apart in a multistory building. Adding bolts to unsecured houses is one of the most important steps toward earthquake safety. This can be done by a contractor or by someone skilled at home maintenance with proper earthquake retrofit training. Unbraced cripple walls. 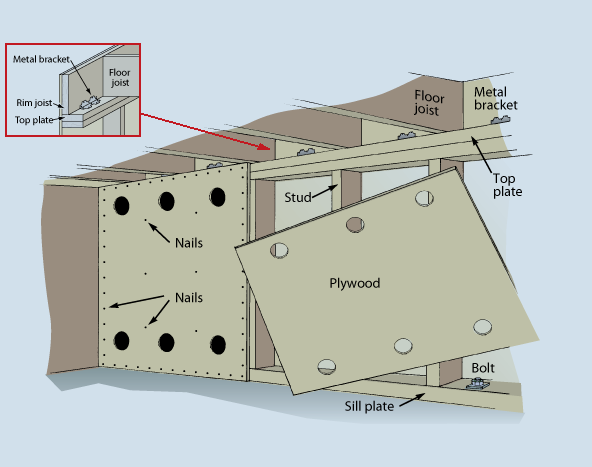 Homes with a crawl space should have panels of plywood connecting the studs of the short “cripple” walls (see figure). You or a contractor can strengthen the cripple walls relatively inexpensively. Soft first stories. Look for larger openings in the lower floor, such as a garage door or a hillside house built on stilts. Consult a professional to determine if your building is adequately braced. Unreinforced masonry. All masonry (brick or block walls) should be reinforced. Some communities have a program for retrofitting buildings made of unreinforced masonry. If your house has masonry as a structural element consult a structural engineer to find what can be done. Inadequately braced chimneys are a more common problem. Consult a professional to determine if your chimney is safe. Advice for how to consult or a contractor or engineer. Structures made of unreinforced brick or block walls can collapse and cause great loss of life. Apartment buildings with “tuck-under” parking space openings can also collapse. Foundation and cripple wall failures can cause expensive damage but less loss of life. Objects attached to the sides of buildings, such as staircases, balconies, and decorations, can break off in earthquakes. What retrofitting has been done on this building? Have the water heaters been strapped to the wall studs? Can I secure furniture to the walls? If you own your home it is probably your biggest single asset. You have worked hard to secure your piece of the American Dream by becoming a homeowner. In seconds, your dream can become a nightmare when an earthquake strikes and damages your home and personal belongings. Even if you follow the steps in this website, it is likely your home will still have some level of damage, and you will need to repair or replace belongings. One option for managing these potential costs is to buy earthquake insurance. Renters and homeowners can protect themselves with earthquake insurance. Without earthquake insurance, you will be responsible for all costs to repair or rebuild your home and replace your personal property. Residential policies do not cover earthquake damage. For more information, contact your insurance agent or go to EarthquakeAuthority.com. Earthquake insurance in California is typically not part of your homeowners insurance policy; it is generally a separate policy you can purchase when buying homeowners insurance. All insurance companies that sell residential property insurance in California are required by law to offer earthquake insurance to homeowners when the policy is first sold and then every two years thereafter. The cost of the earthquake policy you are offered is based on a number of factors, including your home’s location, age, construction type, and reconstruction cost. It is up to each homeowner to consider their individual risk factors and then weigh the cost of earthquake coverage against the benefits that coverage may offer after a devastating earthquake. Many companies issue California Earthquake Authority (CEA) insurance policies, which can help you replace your belongings, rebuild your home, or live elsewhere temporarily if your home is damaged by an earthquake. You may purchase a CEA policy only through the CEA’s participating insurers. A complete list is on the CEA web site at EarthquakeAuthority.com, which has an online premium calculator. Contact your homeowners insurance company or agent to help you evaluate your earthquake risk factors and then consider whether earthquake insurance is a good choice for you. Myth #2: Don’t be fooled! The best building codes in the world do nothing for buildings built before a code was enacted. While the codes have been updated, the older buildings are still in place. Fixing problems in older buildings — retrofitting — is the responsibility of the building’s owner. If you live in a single-family home or duplex, the strength of your home depends on when it was built, its style of construction, and its location. If your home scores 13 or more points on the quiz, you probably should have an engineer, architect, or contractor evaluate it unless it has been strengthened in the past few years.